In the winter we tend to eat pasta dishes that are full of rich sauces and deep flavors, but in the summer I like to change it up and make pastas that are a little lighter and fresher in flavor and texture. 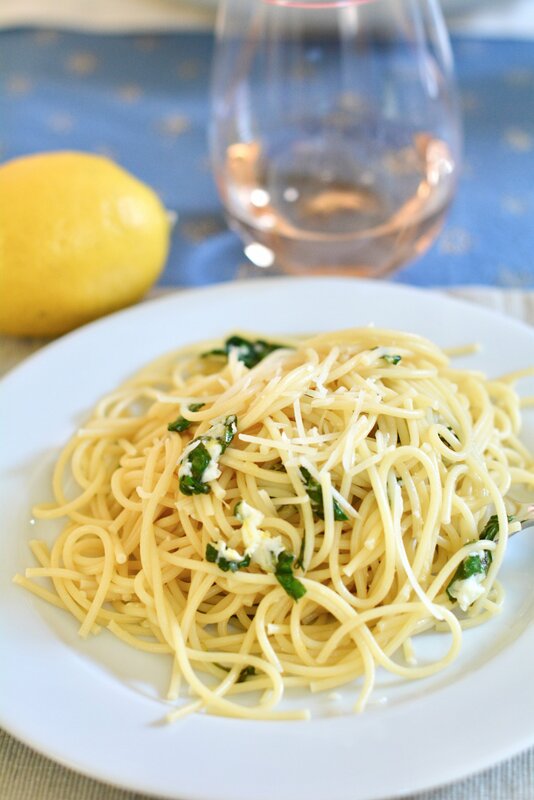 One of these summer favorites is our lemon pasta with spinach and basil. I make a light lemon “sauce” using lemon zest and juice, a touch of mascarpone cheese, and pasta water. Then I finely chop fresh spinach leaves and some basil fresh from my garden, add it to the cooked pasta, and swirl it all together. The result is this creamy lemon pasta with freshly wilted spinach and basil. I top it with a touch of Parmesan cheese for the salty tang, and lovely summery pasta dinner is served! Want to add some protein into the mix? Toss in some cut-up cooked chicken or shrimp. Want to add more veggies? Throw in some yellow tomatoes. The best thing about this lemon pasta with spinach dish (other than the delicious taste of course) is that it can be customized to your liking. No fancy ingredients are required for what is a very satisfying meal. 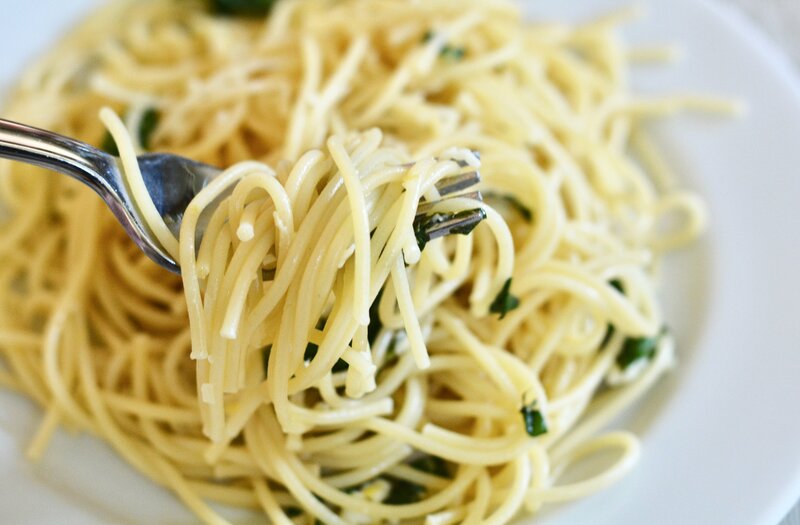 Looking for a quick and easy weeknight pasta dish with a no-cook sauce? This lemon pasta with spinach recipe is the answer to your dinner prayers. Step 1: Make the sauce by combining the mascarpone, lemon zest and juice, and salt and pepper in a medium bowl. Set aside. Step 2: In a large pot bring water to a boil and cook the spaghetti according to directions. Reserve 1 cup of the pasta water when draining. 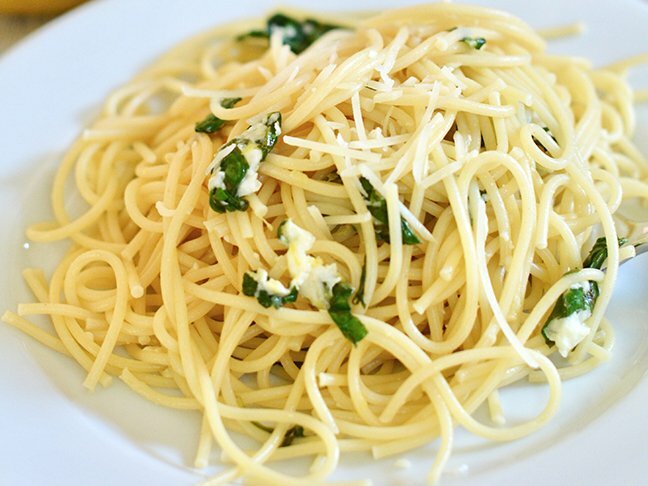 Step 3: Immediately return the pasta to the pot over low heat and stir in the mascarpone sauce, spinach, and basil. Add about 1/4 cup of the pasta water and mix it well. It should help smooth out the sauce and cook the spinach. Continue stirring the pasta over low heat until spinach and basil are completely wilted and cooked. Step 4: Serve the pasta in bowls topped with Parmesan cheese.